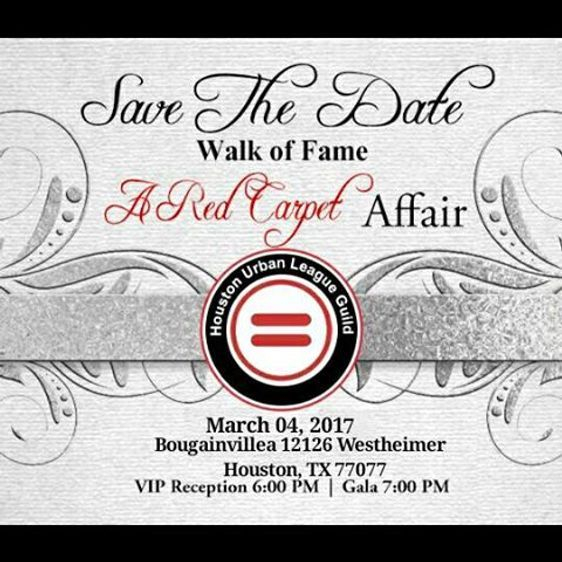 This is a personal request for your support of The Houston Area Urban League Guild’s Walk of Fame - Red Carpet Affair on Saturday, March 04, 2017 at the beautiful Bougainvillea Event Center in southwest Houston. The Houston Area Urban League Guild Red Carpet Affair is the primary fundraiser for the Guild. This fun and festive evening includes a fine buffet style dinner and dancing. Cash bar service available throughout the evening. Awards will be presented. You may purchase your individual tickets, group's table or a sponsorship online.